NEW MYRIOBIBLON: 5 - Book Review: "Occult America: The Secret History of How Mysticism Shaped Our Nation"
This is a mistake, he says, because to fully understand religion in America -- perhaps the most religious nation in the world -- "to really grasp the religious development of our nation, its occult movements and believers must be understood for what they are: communities of belief, who left a profound impact on the culture of America and the modern world." Horowitz: "Early American history is entwined with esoteric spirituality. North America’s first intentional mystical community reached its shores in the summer of 1694. That year, the determined spiritual philosopher Johannes Kelpius led about forty pilgrims out of Central Germany--a region decimated by the Thirty Years’ War--and to the banks of the Wissahickon Creek, just beyond Philadelphia. The city then hosted only about 500 houses, but it represented a Mecca of freedom for the Kelpius circle, who longed for a new homeland where they could practice their brands of astrology, alchemy, numerology, and mystical Christianity without fear of harassment from church or government." From this beginning, other mystical thinkers from the Rhine Valley came to Ephrata, PA and built a larger commune. Yet another movement, the "Shaking Quakers" -- later called the "Shakers" -- was a sect of people fleeing persecution in Europe -- Manchester, England in the case of Ann Lee -- who brought her Shaker sect to upstate New York in 1776. That same year, 1776, a Rhode Island girl named Jemima Wilkinson declared herself a spirit channeler, Horowitz writes, took the name "Publick Universal Friend" and began to preach across the Northeast. Word quickly spread that the New World was a refuge for those who wanted to practice faiths that were forbidden in Europe and those who marched to a different drummer -- especially those of a supernatural bent -- found a home in America. Horowitz devotes a great deal of space in his book to a region of central New York state called the "Burned-Over District" for its religious passions which gave birth to a variety of religions. Among them were Mormonism, Seventh-Day Adventism and a variety of cults or sects involving seances, mediumship, table-rapping and other varieties of expression. The area stretched from Albany to Buffalo and Horowitz calls it the Mt. Sinai of American mysticism. Influenced by such progressive movements of the 1830s and 1840s as suffragism -- the movement to allow women to vote -- many of these new movements were led by women, giving them their first opportunity to openly serve as religious leaders. Think Mary Baker Eddy, the founder of Christian Science. The Burned Over District was home to a young man named Joseph Smith, the founder of the Mormon church, which wasn't particularly open to the idea of women preachers, to say the least. To this day, women are barred from the priesthood of the Mormon Church. As described by Horowitz, the occult found adherents in a broad spectrum of America's population, from First Lady Mary Todd Lincoln, who convinced her husband to host a seance in the White House, to African Americans, many of whom embraced the tradition of "Hoodoo" -- not to be confused with Voodoo. This expression of Hoodoo influenced the thinking of pioneer abolitionist Frederick Douglass, as well as black nationalist Marcus Garvey, Horowitz writes. Among the many people Horowitz writes about is an Idaho druggist named Frank B. Robinson, who created a mail-order religious faith called Psychiana, "bedrock New Thought, packaged and sold to an audience of unprecedented proportions." Robinson's sect grew to be the world's eighth largest religion during the Great Depression, Horowitz writes. New Thought proponents claimed Ralph Waldo Emerson as their "founding prophet," Horowitz says, and maintained that "the individual's creative mind was one and the same as the creative force called God. As such, a person could literally think his dreams to life." Horowitz says that New Thought encompasses such thinkers as Norman Vincent Peale ("The Power of Positive Thinking"), Dale Carnegie ("How to Win Friends and Influence People"); Napoleon Hill ("Think and Grow Rich") and, of course, Mary Baker Eddy. 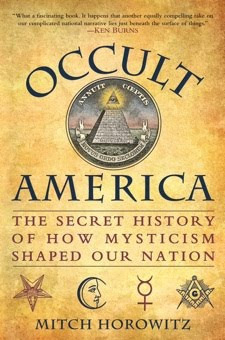 "Occult America" fills a gap in the knowledge of religion for most people, since writers on religion have avoided the subject, instead concentrating on major, well established sects. If you've wondered about the meaning of the symbols on the one-dollar bill or the origins of the Ouija board, "Occult America" is a good one-volume introduction to the subject. It's an important contribution to the history of the nation, since much of our often confusing (and confused) nation is best understood in the context of mystical movements in the U.S.